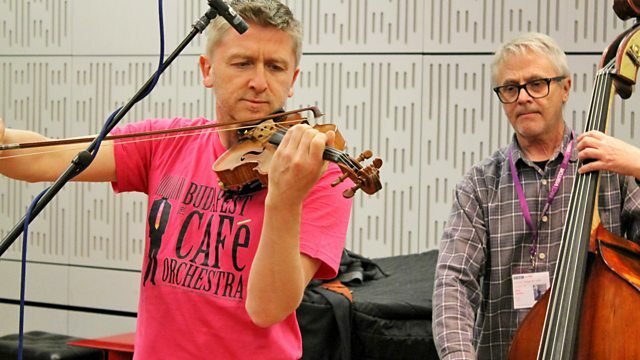 Sean Rafferty's guests include conductor Robert Hollingworth as I Fagiolini prepare to release their new disc celebrating Monteverdi. Plus live music from Budapest Cafe Orchestra and Milan Siljanov. Dvorak: Legends: Prague Waltzes: Buadapest festival Orchestra / Ivan Fischer. Ensemble: The Sixteen. Conductor: Harry Christophers. Claudio Monteverdi, Vespers of 1610. Music Arranger: Christian Garrick. Ensemble: Budapest Cafe Orchestra. Performer: Christopher George. Conductor: Charles Mackerras. Orchestra: Scottish Chamber Orchestra. Wolfgang Amadeus Mozart; Symphonies; SCO; Sir Charles Mackerras. Ensemble: His Majestys Sagbutts and Cornetts. Orchestra: English Baroque Soloists. Conductor: Sir John Eliot Gardiner. Ensemble: I Fagiolini. Conductor: Robert Hollingworth. Ensemble: I Fagiolini. Conductor: Robert Hollingworth. Ensemble: The English Cornett and Sackbut Ensemble. Chopin: Journal Intime: Alexandre Tharaud. Performer: Milan Siljanov. Performer: Nino Chokhonelidze. Orchestra: Royal Scottish National Orchestra. Conductor: Bjarte Engeset. Ensemble: Royal Northern College of Music Wind Orchestra. Conductor: Clark Rundell.